Most people contemplating a major home renovation--interior and exterior plus a carriage h use and a party barn--might be looking for ways to simplify and speed up the process and minimize inconvenience and stress. Not West Knoxville homeowners Hope and Scott Davis. The Davises have turned the complete renovation of the home their family has lived in since 2003 into a fundraiser for Alzheimer’s Tennessee: Alzheimer’s Tennessee’s Designer Home and Garden Tour. “We had considered selling and moving on the lake,” said Hope. “We bought a house in RiverSound and realized it was going to be a total renovation, so we thought, “let’s renovate this house instead.’ We love the setting, the house, the privacy.” Meanwhile Hope crossed paths with designer Elizabeth Grant. Elizabeth, a designer who describes herself as “semi-retired,” said, “I reached out to designers I knew. They were all eager to participate. “The footprint of the [6,800 square foot] house is the same,” said Hope. “We turned a breakfast nook into a side entrance to the house through the kitchen. Every room was renovated. We worked with Stephen Davis Design and Andrew Smiddy to change the [exterior] look of the house from a Stephen Fuller Southern Living house to a Craftsman style house." The Craftsman style is most evident in the roofline and the renovated front porch, which was decorated for fall by Jennifer Parkhurst and Brittany Vaughan of Back Porch Mercantile. Natalie Clayman and Lori Moreno of Natalie Clayman Interiors created the master bedroom and bath. Standard Kitchen and Bath provided the cabinetry for the master bath. The result is a fresh looking space with white and blue furniture accented with coral, gold, green and blue. The luxurious master bath combines dark cabinetry with white tile, countertops and towels. Chris McKenry, owner of Closets by McKenry, created a large closet and adjoining laundry room as part of the master suite that are both functional and attractive. Wolfgang and Diane Schaber of Wolfgang’s Interiors and Gifts used off whites, grays, light blues and blush tones in the living room. The sophisticated dining room was created by Sandy Kozar, Taryn Stait and Rachael Sheridan from Decorating Den Interiors. 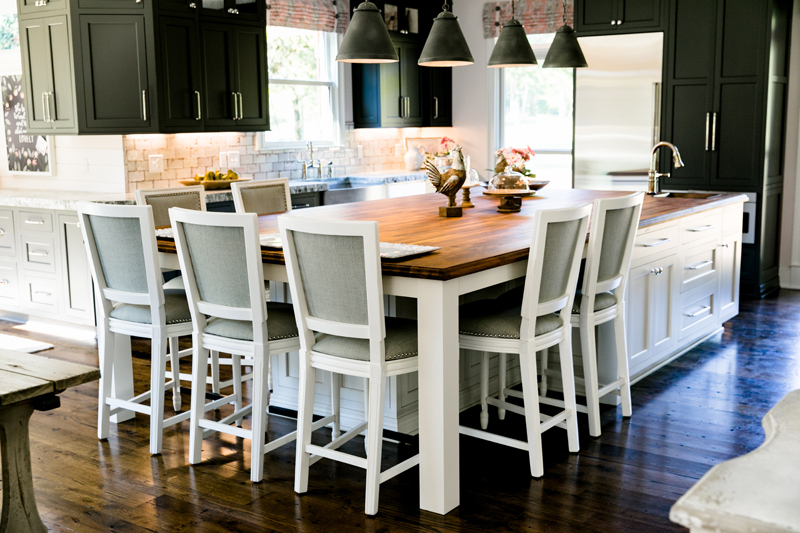 Kendra Campbell of Standard Kitchen and Bath designed the large kitchen, pairing Mouser cabinetry in dark “greige” and white with countertops from Smoky Mountain Tops. The kitchen’s distinctive backsplash was created by Exact Tile Inc.
Sally McFalls and Blair Collins of Cottage Door Interiors decorated the kitchen along with the adjoining family room and new side entrance. In addition to the home, there is a carriage house and a party barn. Scott Davis uses the carriage house as an office, but for the show, it has been decorated as a guest house. Scott and Hope use the party barn for large-scale entertaining, which they say they enjoy. During the show, the party barn, decorated by Castleton Events, is being used for a preview party, cafe and gift shop as well as workshops, a trunk show and a fashion show. The Davises, who have been living in the RiverSound house during the renovation, are eager to move into their newly renovated home at the end of October. The Alzheimers' Tennessee Designer Home and Garden Tour continues through October 14. For information regarding schedules, ticket prices and location, go to alz.tennessee.org.